NextReports has a Wizard tool to be used for creating reports and charts in a simple and rapid way. Starting with upcoming 6.0 version, users will be also able to select report type. For table there is no big difference than a default report. You select your columns and a template and the layout is almost identical with that of a new standard report. There is no header row with a title and no footer row. For alarm, wizard is very useful because it will automatically create the needed layout (two cells, first with formatting conditions for color, second with an expression to show a custom message). This layout was explained in an earlier post. Alarm conditions (formatting condition) are used to set the background color of alarm. These conditions must have disjunctive intervals (a value must be contained in just one interval). 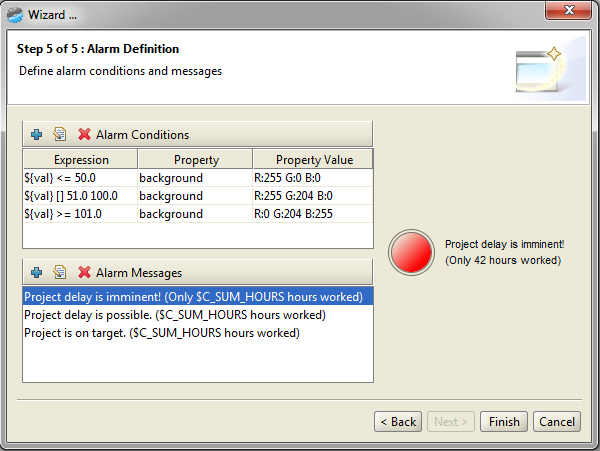 For every created interval inside alarm conditions, user has to create a message. The alarm's actual value can be used inside the message through a tag like $C_<column_name> .